"What a way to start the new year, not to forget the millennium. Truly this is our most favourite place in the world. Stay well. Thanks for the wonderful Tassie hospitality and friendship." 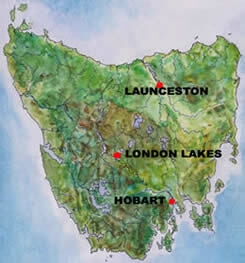 Tasmania is the island state of Australia and London Lakes is sited at its geographic centre. Tasmania lies at the same latitude south as Christchurch, New Zealand and Viedina, Argentina. It is as far south of the equator as Boston, Chicago and Muroran, Japan, are north of it. Qantas has numerous connecting daily flights from all Australian capital cities. The Spirit of Tasmania ferries passengers to Tasmania overnight from Melbourne. 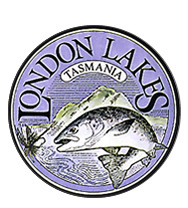 London Lakes is a safe two-hour drive up the picturesque Derwent River valley from the beautiful seaport capital, Hobart, in the South. Dominated by Mount Wellington, the city of Hobart is reminiscent of Portland, United States of America, and Cape Town in South Africa. The drive from Launceston negotiates the Western Tiers escarpment, traverses our high lake country on good roads and takes a similar time. Rental cars are available from either airport. Airport pickup also can be arranged. 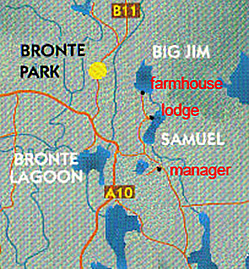 On the left, there is a clearly marked gate three kilometres along the Victoria Valley Road to Osterley from its junction with the Lyell Highway at the northeastern extremity of Bronte Lagoon. A well gravelled road leads north on the western side of Lake Samuel to the lodge and beyond to the farmhouse on Lake Big Jim. The manager resides in the first house inside the entrance to Highland Waters estate. Note that mobile phones will not work in this area unless they are enabled for islolated areas.